Her Voice Carries is an art project led by Sarah C. Rutherford that features women who are lifting up the voices of others. The intention is to create a network of murals that weave a collective story laced with individual truths. Her Voice Carries began in 2017 by focusing on five women who were living and working in various communities in Rochester, NY (see completed murals below). Each woman was photographed, interviewed, drawn and painted. The project comprised a series of murals located throughout the five sections of the city. As the project grows to the national stage, the concept is refined to selecting one woman from a city and bringing her image and story to a different city, thus building connections across our country as well as emphasizing the commonalities of our human experience through the leadership of empowered women. Haverhill was chosen as the first stop on the National tour of Her Voice Carries. 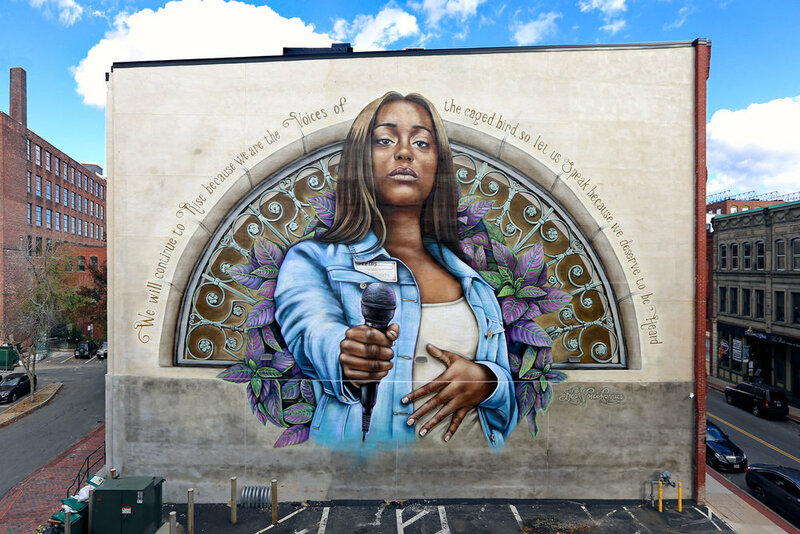 In the fall of 2018, a mural of Shalinda Bollar, a 19-year-old youth activist from Rochester, NY, was painted at 43 Washington St. in Haverhill. Based on an extensive outreach effort and through a public nomination process, a woman from Haverhill was chosen and will be painted in the next city on the tour. Join artist Sarah C Rutherford on May 16th - May 18th, 2019 as she returns to Haverhill to announce the next city and the results of the nominations! There will also be a special early screening of the Her Voice Carries documentary, which will air nationally on PBS in the coming year. The Switchboard, in conjunction with Power of Self-Education (POSE) Inc. will be hosting a variety of related programming on Saturday, May 18th with the mural as the backdrop. For more information or sponsorship opportunities, please contact us at theswitchboardhaverhill@gmail.com. Her Voice Carries, Haverhill is sponsored in part by O+ (pronounced O Positive) a cultural and wellness organization that supports the health of underinsured artists and musicians through Festivals at which they exchange artmaking and performances for wellness services. Special thanks to the City of Haverhill and the Community Development Office for their generous sponsorship of the project. We are grateful not only for their fiscal support, but for their assistance in navigating the logistics of parking, community outreach through the City, and successful messaging.